ENGLAND’S Test captain Joe Root continued his strong Ashes preparations with a third Specsavers County Championship score of over fifty in as many innings, but was outshone by Yorkshire team-mate Gary Ballance’s century. 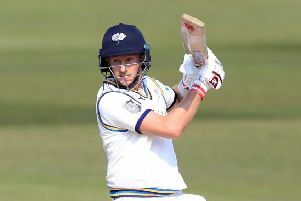 Root had scored 73 and 130 not out against Nottinghamshire in the opening round of the Championship before scoring adroitly on the opening day at the Ageas Bowl. But he fell six runs short of a deserved century, although partner Ballance did continue his liking for the Ageas Bowl with an unbeaten 120. 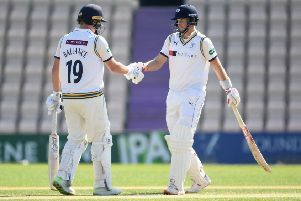 Root and Ballance had complemented each other in an 182-run stand for the third wicket as Yorkshire reached stumps on 310-3. Everything pointed towards a run-filled day with blue skies, a flat wicket and memories of Hampshire piling up 525 against Essex on a similar looking surface earlier in the week. It therefore came as little surprise when Steven Patterson elected to have a toss, which he duly won and decided to bat – although the day did not start perfectly for the visitors. Fidel Edwards grabbed a five-wicket haul, before ending with an eight-for, in the innings victory over Essex and continued his fiery form with the new ball. The West Indian fast bowler struck in the seventh over as Harry Brook chopped onto his own stumps. Adam Lyth started the day of milestones by reaching his 10,000th first-class run with a crushing cover drive to the boundary. The opener had begun his campaign with 81 in the draw at Trent Bridge and followed it up with 67 on the south coast – reaching the landmark in 68 balls. But he fell before lunch when he gloved behind after Edwards had strangled him down the legside. From then on in it was the Ballance and Root show again – having added an unbroken 252 together against Notts – as Hampshire’s bowlers toiled in the Spring sun. Ballance took the role of the plodder while Root, who is making his last Championship appearances before his international commitments take over, took little risk in his run accumulation. Ballance, in particular, has a long-standing love affair with the Ageas Bowl. Before this match, the left-hander averaged 73.86 across six Championship appearances having scored two centuries and a match-saving double ton in his previous four innings. Ballance also scored 156 in a Test match at the ground in 2014 to add to his spoils in West End. He reached his fifty in 102 balls and seemingly without playing an attacking shot reached three figures 112 balls later, his 37th first-class century. Meanwhile, Root completed fifty in 97 balls, which included a brilliantly played skip down the ground to pump Liam Dawson for a six. But Dawson eventually had the last laugh as he was rewarded for his 28 overs of hard work when he bowled Root with a crushing yorker. Ballance, with night-watchman Patterson, saw out the rest of the day to keep Yorkshire well and truly on top.